Combo Fairies are a special kind of fairy, having nearly the same physical appearance as the fairies in The Legend of Zelda: Ocarina of Time, except slightly smaller. They are a bright, round light that comes in multiple colors and has wings attached. Combo Fairies make their only appearance in the game Donkey Kong Jungle Beat. 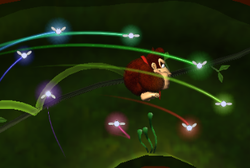 Whenever Donkey Kong performs a combo (a special kind of action, such as swinging from a vine or getting a Jungle Buddy), a Combo Fairy appears and circles around Donkey Kong until he lands on the ground. Upon landing, all Combo Fairies he has collected turn into beats. Donkey Kong, however, cannot get more than one fairy for the same action—he only gets a new fairy for an action he has not performed before. There is no limit to how many fairies can circle around Donkey Kong in the game, though the current known maximum is eighteen. Upon reaching ten combos, the fairies begin to sparkle, and the sound effect that plays when Donkey Kong obtains a combo stops playing. Leaping off a pop-up flower. Jumping off an orange fairy bubble. Leaping off a vine trampoline. Leaping off a chain of Helper Monkeys. Entering and exiting a Dragon Slot. Firing out of a plant similar to a Bubble Shrub. Sliding down and jumping off a rope. The level in Donkey Kong Jungle Beat in which the most combos can be earned is the Chili Pepper Kingdom, more specifically, the level Cloudy Heights. The fairy appears as an obscure model under the name NoteFairy in Super Mario Galaxy, where it is used off-screen to control the appearance of notes. This page was last edited on April 12, 2019, at 13:37.